Poets and writers garnish their script like a work of art and sometimes, to grab enough eyeballs, they compose cryptic and abrupt sentences whose subject continues on to the succeeding lines. This technique is known as enjambment. This Penlighten post defines the uses of enjambment with interesting examples. Famous American poet and author E. E. Cummings is known as the Master of Enjambment for the eccentric style of writing used in his poems. 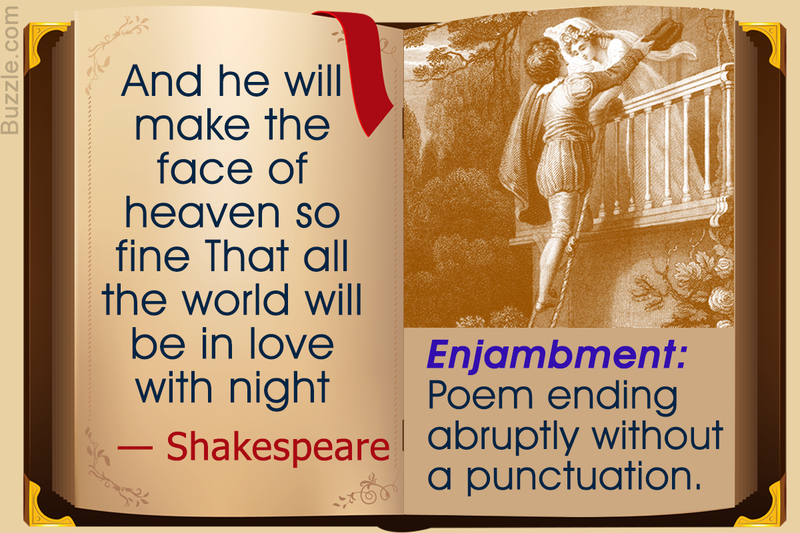 A poetic verse comes in imaginative thoughts expressed through lines, and each line must have a meaningful ending, but there are poets who like to create parallelism, rhythm, and iconicity through their poetry, such eccentric use of words is known as Enjambment. It is a common technique used in modern free verse by poets to paint a canvas of disorted images and disconnectedness to finally fall into the central theme conveyed in the poem. The reader is intrigued to follow the abrupt lines in order to get to the end of the next line to understand the whole picture. Given below are some classic poetic and literary examples that showcase an intelligent way of expressing notions and sentiments. 'Enjambment' is derived from the French word 'enjamber' which means 'straddle' or 'put legs across'. In poetic terms, its proceeding from one line to another without a finishing punctuation mark. It's a poetic imagination or feel, phrase or clause in a line of poetry that does not come to an end at the line break but continues over to the next line. In simple words, it is the flow of thought from one couplet or line to the next without a major pause or syntactical break. ★ The composed poetic or literature lines are devoid of punctuation marks. ★ It's the presentation of a thought or feeling from one line to another without a major break in between. ★ It's a form of guile used by the poet or writer to intrigue the readers imagination by presenting them with two conflicting lines at the same time. ★ A fast pace of rhythm can be obtained by the use of enjambment in poetry. ★ Multiple ideas can be combined without the use of semi-colons, periods and commas. ★ It helps reinforce the central theme that might seem to be perplexing with pauses. ★ It helps readers to keep guessing about the idea which is evinced in one line and which continues through to the next. Enjambment is the element of surprise for the readers as it delays the intended meaning of a line till one reads the subsequent line. Writers use this technique to create mood, a touch of humor, a sense of intrigue, and to rouse the imagination of the readers. In poetic sense, the purpose of using an enjambment is to present a vivid imagination through the lines and carry an idea to the next line without breaking the train of thoughts. Another purpose is to preserve a rhythm that is more substantial than a permanent end-stopping, wherein elaborated themes are expressed in multiple lines. The major noticeable difference between an enjambed line and an end-stopped line is the use of punctuation marks. Enjambment is devoid of punctuation and ends abruptly, whereas end-stopping lines end with punctuation marks like periods/full stops, commas, semi-colons, and colons. burst from the bottles like corks. cardboard rammed in the tines of garden forks. they thought me a hero. black water running fingers through the ice. The poet is describing a tragic incident of a child almost drowning in the icy lake during a harsh winter. The poem has no rhyming strategy but comprises two or three line sentences per stanza. Almost written in a first person account, this structure and enjambment is interrupted by the poet's interrogations and rhetorical questions. The curtest sentence of all "was I there?" stands out, compromising the integrity of the poem. The last stanza breaches the pattern and acts as a concluding sentence. The couplet stands firm, while the other stanzas alternate in length, establishing uncertainty. The poet suggests that the last two lines deliberately rhyme in order to connect like a fairy tale. A classic eccentric style of enjambment poetry, this poem provides a visual image of the night sky as one looks out of the window. He describes the phases of the moon, some nights it appears dark and scary and some crisp and bright. The poet goes through a myriad of emotions before plunging into the deep slumber of dreams. They have proclaimed their malefaction..."
William Shakespeare's plays are filled with enjambments, and the above examples are taken from three of his well-known plays, each of the three have malice, revenge, anger, and sinister designs as their central theme. The above lines showcase enjambment used to convey a depressing sequence of a song. Apparently, the band received inspiration for this song from a suicide note written by a teenager to his parents. Mark Hoppus, a bass player in the band, received it on his email and the band got together to write a slow sad song as a tribute. Enjambment is a clever tool of intriguing the reader by splitting one thought into two lines, thereby forcing the reader to eye the next line before completely processing their thoughts in one direction, and hence, creating tension between word and idea.